Seniors and Loss of Appetite – Is it Normal? As you age, you might find that you’re suddenly eating less than you used to. Due to a decrease in both the level of physical activity you partake in daily and your resting metabolic rate, loss of appetite in seniors is a fairly common occurrence. However, it’s still important to get the essential vitamins and nutrients you need to lead an active, healthy lifestyle. While seniors may need to eat less than younger individuals, losing your appetite altogether could be a sign of a more serious medical condition. What Causes Loss of Appetite in Seniors? Changing senses. Your sense of smell and taste changes as you age, and foods you once enjoyed may no longer seem appealing. Or, changes to your taste buds may lead you to make poor food choices. Dealing with side effects from medications. Certain medications can cause nausea and loss of appetite in seniors. If you are concerned that medications may be the source of your decreased appetite, make sure to talk to a doctor or health professional. Problems with dentures. When your mouth hurts from ill-fitting dentures or from wearing them continually, the discomfort you feel in your gums can make the thought of chewing food unappealing. Dementia or Alzheimer’s disease. As dementia progresses, it’s common for both appetite and weight loss to occur. Mouth and throat infections. Conditions like gum disease or dysfunctional salivary glands can make eating a dreaded activity for some seniors. Thyroid disorders. Medications to treat thyroid problems are often associated with loss of appetite in the elderly. Hepatitis or chronic liver disease. Loss of appetite is known as one of the first symptoms associated with both hepatitis, or inflammation of the liver, and chronic liver disease. Depression. Psychological issues like depression, anxiety and loneliness are often associated with a loss of appetite in seniors. Studies show that seniors who eat alone often eat less and make less healthy food choices than those who dine together. Kidney failure. It’s common for up to 25% of chronic kidney disease patients to have reduced appetites as a main symptom. Some cancers. In particular, ovarian, pancreatic, lung and stomach cancers are known to result in appetite loss. Plus, the pain, fatigue and other symptoms from the cancer also lead to a decreased appetite. It’s important to recognize when your decreased appetite is a problem that needs to be handled properly. If you’re suddenly fatigued along with having no desire to eat, never feel hungry, or have suddenly lost a significant amount of weight, dealing with the underlying issue at hand should be the first consideration. However, there are a few things you can do to kickstart your appetite. First, consider eating every day at the same time. This includes all your meals as well as any healthy snacks. Humans are creatures of habit, and as your body gets adjusted to a schedule for eating, your appetite will be naturally boosted as mealtimes approach. Secondly, don’t heap your plate with giant portions. A large amount of food all in one sitting can be overwhelming and may deter you from eating altogether. Instead, try smaller portions and increase the calories you’re intaking by adding healthy fats like olive oil, whole yogurt or peanut butter. Finally, try not to get stuck in a food rut. We all have our favorite foods, but every so often, get creative and try something new. Remember, your sense of taste may be changing so you might find your favorite new dish! Keep your plate colorful with lots of fresh veggies to make it appealing to the eye, too. Leave the cooking to the talented executive chef at Immanuel Lutheran Communities! Dining options include chef-prepared foods at Buffalo Hill Terrace at The Claremont and The Café. Multiple meal options and times in the Immanuel Skilled Care Center and 24-hour meal service at The Retreat at Buffalo Hill help ensure top quality senior nutrition. 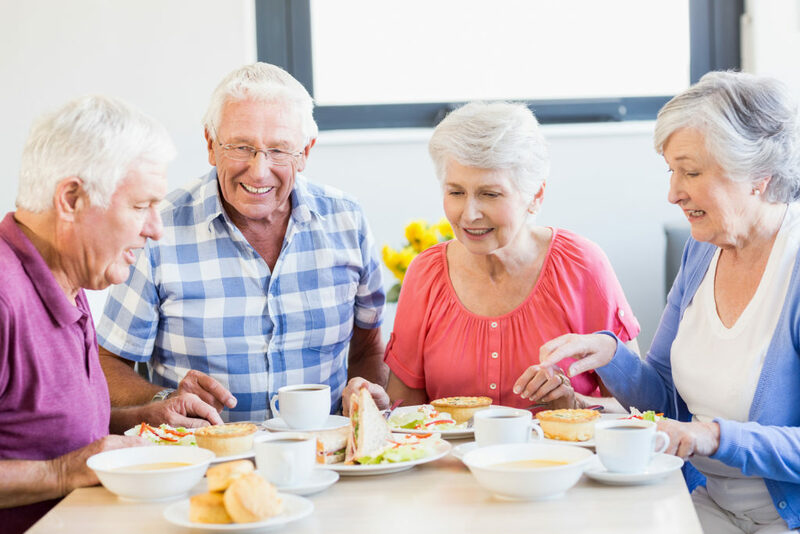 Schedule a visit and stay for lunch, or learn more about vibrant senior living in Kalispell at Immanuel Lutheran Communities by contacting us today.